I am about to blow your mind with the easiest and most tasty pottage you would ever eat ala Asandia Hogan. I met Asandia Hogan on Facebook. She is all things Efik and is a walking Efik Encyclopedia. She is a lovley mother and is passionate about the Efik tradition especially when it comes to cooking. Recently, she had asked me to give her a recipe for something Igbo to cook, but we ended up talking about me cooking Edi Kang Ikong or Ekpang Nkukwo instead; as I had expressed my love for the Efik soups. As usual, she was trying to have me do it the right way. But since I don’t have all the spices, we decided to go for Ukom Isip; which is a simple coconut plantain pottage. As easy as this dish sounds, it is an old and almost extinct dish. I cooked this easily and also hoped she is would give me a thumbs up. I find this dish interesting, as both times I have made it, I have fallen into a food “coma” Asandia please tell me why? And I just cannot seem to get enough of it. My ajebutters are not so fond of boiled plantains, but this one, they loved. The idea of marrying the coconut with the dry pepper is amazing. The Efik gods were definitly honored. Before going into the recipe, I want to talk about one crucial thing and it is the plantains. 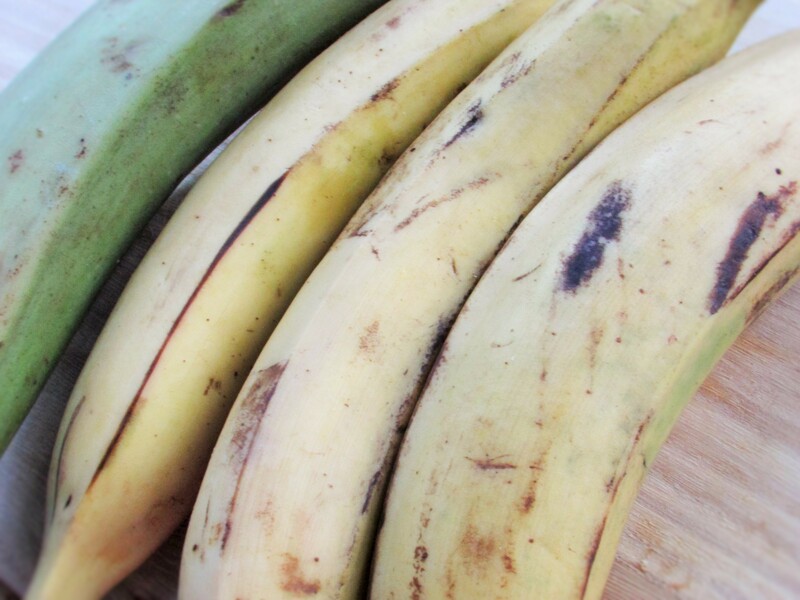 It is safer to use a medium ripe plantain. They are still slightly green, but also yellow and still hard to the feel. 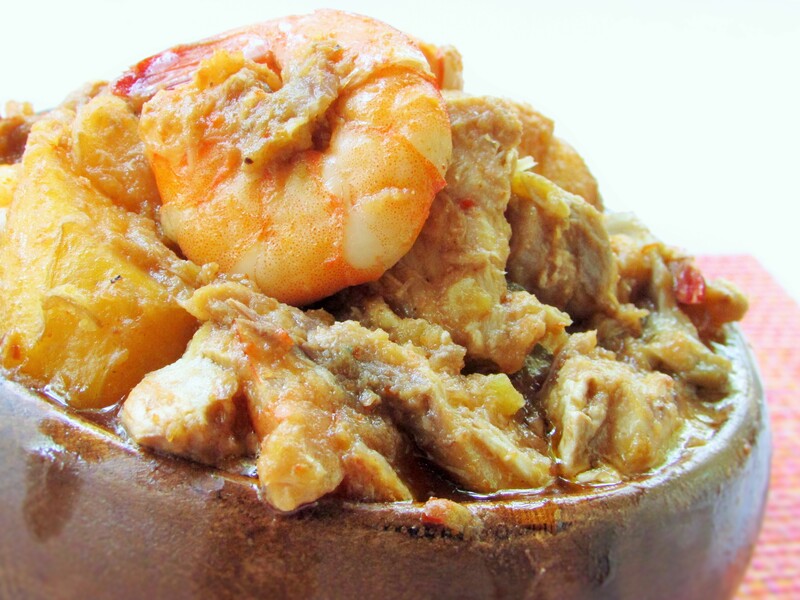 It makes for a perfect plantain pottage. Below is a picture of the type of plantains I used. Notice how I put them close to the green one for comparison. Okay here is a print ready recipe for your enjoyment! 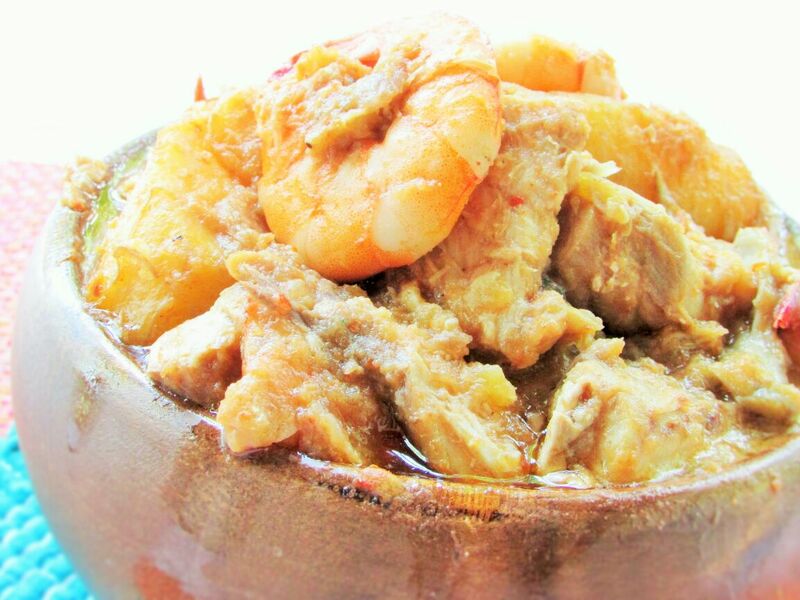 This entry was posted in Efik Recipes, Lunch, main dishes, main meals, Nigerian Casseroles, Plantain Dishes, pottage, Uncategorized and tagged coconut and sea food plantain pottage, coconut plantain pottage recipe, How to make Efik plantain pottage, Plantain pottage recipe, seafood and coconut plantain pottage, Ukom Isip recipe. Its amazing to see another lazy person that loves cooking, i’m passionate about it. GOD bless your soul Nma as you keep enlightening us.